Check out these ideas for a functional laundry space. Laundry. It’s a never-ending process – sorting, washing, drying, ironing, folding. How can you make this tedious chore more enjoyable (or at least more manageable)? It starts with a functional laundry room design. Whether your laundry room is near the bedrooms, shares space with your mudroom, or isn’t a room at all, there are many ideas to make laundry time more efficient. We’ve thought of some here! Custom cabinets, shelves, and closet space help homeowners manage clutter. It’s essential to have space to store detergents and cleaning supplies. You can also keep other items out of sight with custom options, such as a built-in ironing board (we’ve put these in master bedroom closets, too) or pull-out hampers. Consider having countertops at varying heights to help with different jobs – a higher surface for folding, a standard 36-inch height for the sink area. If your space is limited, a countertop built over a front-loading washer and dryer is a great opportunity to maximize space. 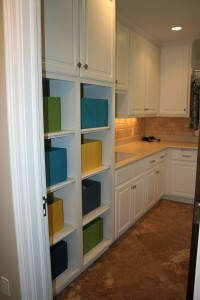 Incorporate cubbies, with a designated bin for each family member, into the laundry room design. This makes it easy to sort clothes and even easier for the kids to put them away. A sink is a useful laundry room feature, helping you perform laundry and other household tasks. Use it to wash hands, soak soiled clothing, rinse paint brushes, prepare plants, and beyond. Under-cabinet lighting helps illuminate the countertop for specific tasks, such as sewing, folding, and attending to tough stains. You’ll need a place to air-dry those delicates, so add a bar or rack for hanging clothes. This may help cut down on ironing time, too. Stone or tile floors are durable, easy-to-clean, and water-resistant, all important characteristics for unexpected dirt or leaks. If you’re going to spend an extended amount of time in the laundry room, make it comfortable. Dress it up with a stylish light fixture. Put a television in the space to help pass the time. Incorporate a window into the design, so you can enjoy the landscape and flood the room with natural light. This entry was posted in Tips and tagged Built-In Ironing Board, Custom Cabinetry, Delafield Remodeler, Hidden Ironing Board, Home Improvement, Laundry Baskets, Laundry Bins, Laundry Hamper, Laundry Room, Laundry Room Counters, Laundry Room Countertops, Laundry Room Drying Rack, Laundry Room Hanging Rod, Laundry Room Ideas, Laundry Room Lighting, Laundry Room Sink, Laundry Room Storage, Milwaukee Remodeler, Pull-Out Hamper, Task Lighting, Utility Sink, Waukesha Remodeler, Wisconsin Remodeler on July 22, 2013 by amanda.